David Gnozzi is a platinum mixing/mastering engineer and producer, as well as the creator and host of the popular YouTube channel MixbusTV. MixbusTV is a highly regarded source for music production techniques and pro audio info. David’s past as a professional songwriter, arranger and his knowledge of mixing and audio gear make him an excellent tutor and channel host. He also has an upcoming hip hop recording/mixing course for Pro Mix Academy! David initially started to gain recognition as a mixing engineer after successful remixes for Ladytron and Felix Da Housecat. He then started mixing projects for Pietro Foresti—an Italian music producer who’s worked with artists like Tracii Guns (of L.A. Guns, Guns ‘N’ Roses) and Scott Russo (of California punk band Unwritten Law). David’s credits also include bands like Kaos India, Audyaroad, Five To Ten, Lambstone, Rhumornero, Colors Void, Cabin Fever, and Italian pop superstar, Valeria Rossi. In 2017, David worked with one of France’s most famous and influential hip hop artists, MC Solaar, mixing the gold album Geopoetique. The release also went on to win “album of the year” at the French Music Awards. David got started with music when he was 9 years old, first playing guitar and then gradually incorporating some piano as well. As he remembers, he wasn’t as proficient on either instrument as he would have liked, and eventually gave up playing all together at one point. By the time he was in his early 20s, however, David picked up the instruments again to write and record music as a hobby. His dabbling became much more than that when he landed a contract with Universal Records as a songwriter and arranger. It was around the same time he actually began recording and mixing as well, mostly in an effort to achieve the sounds he wanted and wasn’t able to get elsewhere/from anyone else. At that point David realized he not only enjoyed, but had knack for, the recording and mixing craft—much more so than his songwriting/arranging “day job.” He threw himself into recording and mixing, learning as much as he could before having a couple of remixes which gave him the opportunity to call mixing a career. Another big career step for David was working with Pietro Foresti, for whom he started mixing all of his projects. Foresti’s artists were major label material, getting radio time, big tours, and of course major label recognition and deals. David noted that many of the projects he mixed for Foresti consisted of both quality material and commercial potential. David mixed MC Solaar’s successful 2017 release. Most recently, MC Solaar’s Geopoetique was a major moment in David’s career as a mixing engineer. The album was not only commercially successfully, but critically acclaimed, winning album of the year at the French Music Awards. For David, going from mixing mostly rock music to having a highly successfully hip hop record under his belt was a defining moment. Finally, MixbusTV is a fantastic outlet for David to provide professional mixing and mastering tutorials, tips and tricks, production techniques, and sound design methods. It’s also a means of providing unbiased gear reviews for other pro audio professionals or hobbyists looking for additional info before making a major equipment purchase. Waves MV2: According to him, the Waves MV2 “should be illegal” because of how good it is. The MV2 is a compressor with extremely streamlined controls for maximum ease of use and effectiveness. As David notes, it control dynamics and gives elements body and life without being overly colorful. Its transparency is actually what makes it one of his favorite compressors. Waves Kramer HLS Channel: This channel strip plugin was developed to model the Helios console Eddie Kramer used on sessions at London’s Olympic Studios. It’s a great plugin if you’re after vintage-modeled saturation and drive from the preamp, or specific coloration from the 3-band EQ. Waves SSL G-Channel: David uses the Waves SSL G as the first plugin insert on his tracks. Developed under license from SSL, the Waves emulation is a go-to choice. Though there are many other great versions of SSL channels by a variety of companies, David always goes back to the Waves model! Klanghelm MJUC: Klanghelm’s MJUC is a variable-tube compressor meticulously modeled after Manley’s famous Vari-Mu, with 3 different models built in. It works so well that David opted to not purchase a hardware Variable Mu, because he couldn’t justify the cost-to-quality difference between the Klanghelm and Manley! 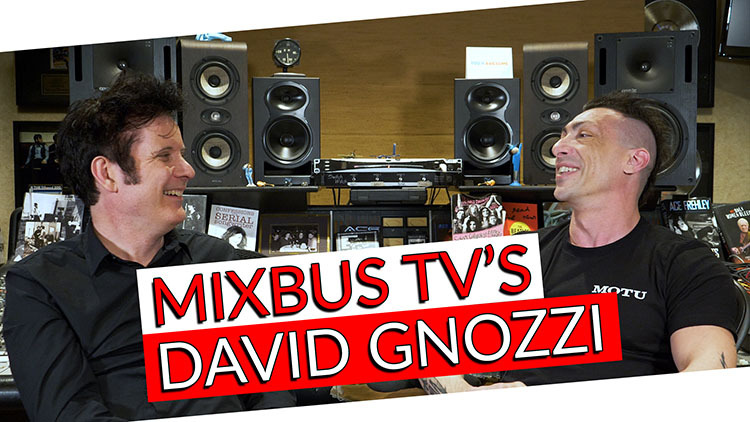 Please visit David Gnozzi’s MixbusTV for music production and mixing tutorials, tips & tricks, equipment reviews, and more, as well as his hip hop recording/mixing course for Pro Mix Academy!